Mr. Osiel Torres. 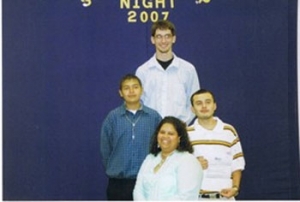 President of Luviano Roofing Co. was invited to the ‘07 Migrant Award Night at Okeechobee High School. Mr. Torres was once a member of the Migrant Program at OHS where he received assistance to attend college. 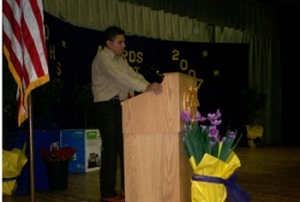 During his speech, Mr. Torres encouraged graduating seniors to pursue their goals, dreams and to attend college. Luviano Roofing Co. donated a total of $2000.00 to ‘07 graduation seniors at Okeechobee High School. Mr. Osiel Torres, President of Luviano Roofing is an OHS graduate of ’02. Mr. Torres believes that now its time to give back to the community and he will continue supporting the high school in the years to come. Next year Luviano Roofing will again contribute to the donation of scholarships but this time in partnership of Luviano Construction Co., of which Mr. Osiel Torres is also the president.